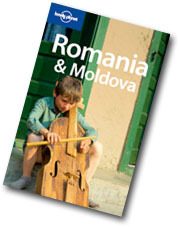 we recently visited Romania, using your ‘Romania & Moldova’ guidebook, 4th edition. As always, your guidebook proved to be an invaluable travel companion. There were, however, a few places where information in the guidebook was outdated or incorrect. We would like to use this opportunity to report those inaccuracies to you. Below you will find our suggestions. It might be handy to add that most buses only allow punching a ticket on-board after the motor of the bus has been switched on. In general, we experienced little problems with pre-booking tickets from the train station, instead of via CFR offices, even 24 hours or more before departure. The ticket sale system in general seems to have been modernized a lot at most places. We flew with Sky Europe from Vienna. Baneasa is very, very small and crowded. Even though the taxi drivers (they are as terrible and rude here as on Henri Coanda) say otherwise, there *is* an ATM in the airport, hidden between waiting passengers on the west side of the main hall (with your back to the street). There is a bus stop (the taxi drivers again say that it doesn’t exist) that goes directly to the city center. This is on the opposite side of the main street in front of the airport. Tickets are sold in a shed with a small bus logo sign. We didn’t have any problems with entering the platform without a ticket. The queues were still very long and people spoke little or no English. Students get in for free! The entrance is hidden very well from the street (only a single small paper points to the correct direction). Student entrance fees are 5 lei now. Undergoing ‘renovation’ now, using concrete and cement! The small chapel is being ‘improved’ by a concrete portal built in front of it, over old frescoes. Terrible. See previous entry. Also being ‘restored’ with concrete. Not as cosy as mentioned in the guide. All the streets are being renovated. Maybe somebody used Google translate to translate the original Romanian text? We couldn’t find the ‘hidden rooms’. Maybe this could be better indicated in the guide? We found the souvenir shop rather expensive. However, there is a new book shop above the souvenir shop that is very good and has an extensive selection of English books. They also have a cafe with about 100 different kinds of tea. We stayed in Hotel Carpati, which was pretty ok even though the prices have increased quite a lot (a double is now 200 lei / 57 euro) and the beds were so-so (one of the beds felt like somebody put a drawer of cutlery underneath the mattress). Unfortunately, one of the budget options in the guide (Hotel Muntenia) has been closed, a local told us it was ‘demolita’ (demolished). Getting here by maxitaxi from Brasov was quite a feat (also, they run every 45 instead of 30 minutes). We took the train back, which was much easier and comfortable (although they don’t run quite as often). Is also opened on tuesdays. An ‘extended’ tour of the castle is available for a staggering 50 lei. Photographing and filming costs 50/70 lei. Renovation is complete and the palace is now open to the public! We found this place to be as beautiful (maybe even a little more) than Peles castle. The same as with Peles, an expensive ‘extended’ tour is available and high prices are asked for photographing and filming. Not open on tuesdays. We couldn’t find it. Better directions might be helpful. It is probably better to take the other route to the top when hiking, following yellow triangles. The entrance to this path is west of the cable car. This takes about an hour and has better paths and more steps. We stayed in Hotel Postavarul, which was very good. Prices are still very low (only 84 lei for a double) and our bed sheets were cleaned every day. It might be a little scary at night with all the long corridors, but we thought it was really wonderful. Restaurants and terraces have sprang up all around Str. Republicii. Unfortunately, most of them are still pretty bad and not worth their money. Bella Musica was the only one we would recommend, also because they serve a free plum brandy with every meal! One of the highlights, much better than the touristic Bran castle. It might be handy to add to the guide that the steps from Piata Unirii start underneath from the port left to the ‘Pub-castel restaurant’. See Rasnov. Very touristic, an enormous amount of kitschy Dracula souvenirs and very long queues. The bus line seems to have changed here as no busses went from Autogara 2 or 3 to Harman (as indicated in the guide). A few tourist offices have been opened around town. Some of the streets and sights are undergoing renovation. The train station is completely modernized with modern facilities and very friendly staff speaking English. The ‘combo ticket’ is now indicated clearly inside the museum. Photo/video fee is 50 lei! Now open to the public, although still under renovation. Mildly interesting. We slept at ‘Burg Hostel’, which was ok and pretty clean and cheap (100 lei for a double). The breakfast was not worth it (5 euros). Why do they think that people like bell peppers and feta cheese for breakfast? The bus system was pretty incomprehensible. Lots of things have apparently been changed since the guide was last published. The bus station is east from the train station (when having your back to the station), but not all busses run there. The other buses run in front of the station, but not the trolley buses. We couldn’t find out where those ran or where we could buy tickets for the trolley busses. A free map can be picked up at the tourist office (which also offers expensive rooms in its building now). We were in the middle of a great folk music festival, lasting the whole week (we visited Sibiu from august 8 until 11), with lots of Romanian and foreign groups performing their music and traditional dances. The stage was on Piata Mare. We flew back from Sibiu airport, which was very clean and clear. Unfortunately the bus service (trolleybus 8) seems to have disappeared and we needed to take a taxi (we payed around 12 lei). We had some problems with our carrier (Blue Air), who suddenly changed our flight from 15.00 to 16.00 (they said it was a delay, but that seemed very unlikely to us), so that we almost missed our train in Cologne. In addition, it might be handy to put in the guide that Romania is not a Schengen-country, so people from Schengen-countries (such as the Netherlands) still need to go through passport control on arrival (this took ages at Cologne / Bonn airport). This might be obvious for people from the UK (which is not a Schengen-country either), but it wasn’t obvious to us. Both Humanitas and Schiller are now open on saturdays and sundays! It might be handy to add that the tower can be quite scary for people with fear of heights because the wooden/steel step construction in the tower from the end of the 19th century looks pretty fragile! Open, but undergoing restoration. Tomb stones are now open to the public without asking first. Piata Mare also has lots of nice bars serving drinks. We thought the museum was pretty so-so, with heaps of very average Italian and French paintings. The few ‘highlights’ of the museum are now kept in glass sarcophagi that makes viewing the paintings in detail quite difficult. We were very lucky to find accommodation, everything is booked full very fast in comparison to the other places we visited. We stayed at Pensiunea Daniel, from the same people that run Pensiunea Ela. We payed 180 lei for a double. Breakfast was very good and the rooms big, but the beds were the worst we had in Romania (the mattresses felt like somebody put a sheet over a bunch of rooftiles) and literally everything in the bathroom seemed to break or fell from the wall as soon as we touched it. Aside from that, we had quite a pleasant stay here. We visited this on a day trip from Sibiu. In our opinion it wasn’t that interesting and busses ran infrequently, especially on sundays. The citadel (with the church) has a small ticket office now with guided tours in English and German. Unfortunately we couldn’t climb the bell tower because it was a ‘bad day’ (whatever that means).